There are lions on Hvar. You can see them lurking on walls and gateways, looking out with a rather pained expression. It’s the symbol of St Mark, the winged lion of Venice, showing that this island was once part of the Venetian empire. From 1278, when the locals petitioned Venice for protection from the pirates, the town of Hvar was an important naval base, a major hub of sea traffic in the central Adriatic. 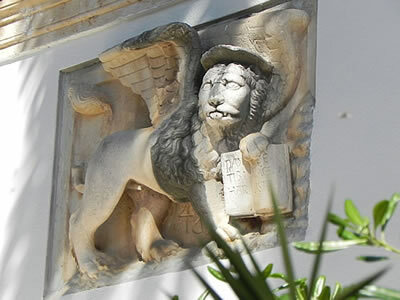 St Mark’s lion is a very distinctive heraldic symbol – one of the strongest branding logos of its day. 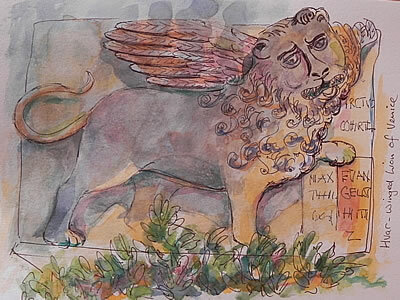 It’s a winged lion, sometimes shown with a halo, resting one paw on an open book that contains the latin inscription Pax tibi, Marce, Evangelista meus. (Peace be with you, Mark my Evangelist) or some abbreviation of that. Apparently in wartime, there was a more assertive variation holding a sword in one paw and the other resting on a closed book, for protection. Haven’t yet seen one of those on the island. 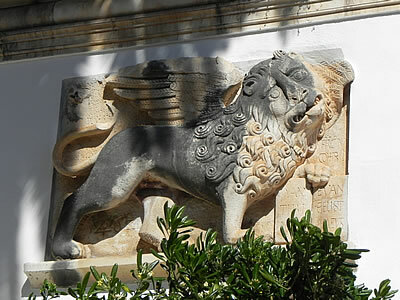 A second Venetian Lion, also on the Loggia wall, wears a halo and holds his book. Is he really sticking out his tongue? It’s the faces on these lions that I find so appealing. Each one is different, and I wonder if the sculptors had ever even seen a lion? The rest of the body is a perfect depiction of a lion, but the faces seem very human, full of character, with a wonderful range of expressions. 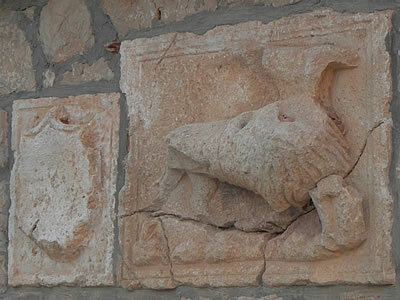 Outside of Hvar town, the lion is less in evidence. There is one to be seen in Vrboska, if you know where to look. The symbol of Venice was not as popular there, following the bloody suppression of the peasant rebellion by the nobles in the early 1500s. What’s left of the hated Venetian symbol can be seen on the wall of an old single story building on the north side of the Piaca. And lastly, here’s my own sketch of one of the lions, the one with the distinctly constipated expression! 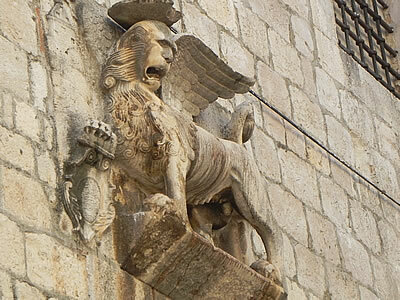 Hanging in almost every corner of Venice, the beautiful sculptures of the winged lion represent the symbol of this city and of the land conquered during its vast dominium and ancient Republic. Other than decorating the city or showcasing the conquered places, some lions such as the lions’ mouth of truth had curious and less ornamental purposes. Still visible in Venice and crafted as white marble bas-reliefs, these mouths of truth were depicting the head of a lion or sometimes, an elaborate facial expression. In place of the mouth, there was a hole to insert the sheets of paper with the secret complaints of the Venetians. The complaints could relate to several types of crimes including blasphemy and tax evasion. Due to their huge popularity, the Lions’ mouths of truth were located near the hospitals, on the facades of churches, near the houses of judges but also in St. Marks’ square, Palazzo Ducale. The charges could not be anonymous and had to cite at least two witnesses, otherwise the accusers were burned by the judges. The most dangerous secret complaints were those that were made on charges of treason and conspiracy against the State. It seems that the first Lions’ mouths of truth were introduced after the attempted coup of Baiamonte Tiepolo in 1310. In this case, even without supporting witnesses, complaints were forwarded to the dreaded Council of Ten, who immediately investigated the suspects. Thus began the shadowing and often preventative imprisonment of the accused. The suspect could remain for weeks or months in chains, awaiting trial. Through the years, Venetians have been replicating sculptures of lions and there are still a few companies in Venice, such as Ithaca Art http://www.ithaca-art.com who continues to replicate by carefully following the ancient techniques.